Possessions curated over a lifetime are displayed with pride around baby boomers’ homes. With their parents’ Great Depression values instilled in them, boomers are a generation of savers. Things in basements, garages, attics, closets and cabinets overflow into living spaces. Never used wedding gifts in unopened boxes have gathered dust for decades. More boxes overflow with the kids’ art “creations,” baby outfits and every school paper – saved to pass along to them. Hey baby boomers (born 1946-1964) – here’s the new reality. Millennial children (born 1980-2000) don’t want your stuff. They grew up during the Great Recession and learned to save money rather than things. They tend to live in smaller homes sans formal living and dining rooms. Waterford crystal, fine china service for 12, and brown wood furniture are out. Gravitating more toward urban life, Uber is more practical than owning a car. There’s no need for scrapbooks; their photos are digital and lives are lived on social media. Smartphones and tablets replace TVs. Less is more. Whether downsizing for a move or simpler life with fewer things, boomers are discovering, to their dismay, that their kids eschew their tchotchkes and memorabilia. Boomers’ treasures are flooding consignment and thrift stores. Precious items have lost so much intrinsic value and interest that many end up being donated. Unless forced to downsize due to, say, a move, it’s easy to procrastinate about downsizing. There is just so much stuff! But delaying the inevitable makes it harder as things continue to accrue and values continue to fall. Unexpected illness or injury happens. Would you want this put on your kids? What do you do? Start decluttering now. September is Self-Improvement Month. Autumn began this week. Days are cooler here in the northeast. Before it gets too cold, now is a splendid time to attack the attic or outdoor spaces like the garage. Eliminate what you no longer need or want, organize what remains and create simple systems that work for you to maintain it all. Recycle or donate all you can. After those spaces are organized, start inside. As days become shorter, more time is spent indoors. Use that to your advantage. Take a moment to walk through your whole house. See what’s in each room, closet and cabinet. See everything as if you were a stranger. Then decide if your house looks and functions how you want. If not, change it. Pick a room or closet to begin, figure the amount of time you will spend every day or week and, to take this seriously, note the blocks of time in your calendar. 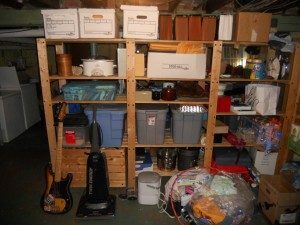 Just like the garage, after you declutter create homes and systems for everything. When you’re done with that space, move to the next and so on until you’ve finished the areas you want organized. Most importantly, you must create new habits or old habits will return things to the way they were. Guaranteed. People have Too Much Stuff! Being disorganized is exhausting. It wastes a great deal of time and causes stress when you can’t find what you need when you need it, constantly race to get things done, and miss or are late for appointments. Clutter makes it impossible to clean and causes tripping hazards, which creates an unhealthy home. Being organized and having fewer things make life so much easier! Imagine knowing where every item is located so that you can grab it immediately, things are done on time, no more frenetic running around, laundry is up to date, instant selection of what you want to wear each day, paperwork is current and easily managed, a functional calendar, no more missed or late appointments, a car or two in the garage and No More Clutter! It’s all doable. And, once organized, it’s super-simple and quick to maintain. My bedroom closet is organized by type of clothing and color. There is only one spot for every item. If I want to wear black slacks, I go to the slacks section, then black slacks and choose. There is no need to look anywhere else. Every space in my house is organized so I know exactly where to find everything. You can have the same functionality! Lastly, remember your ABCs — Always Be Clearing! Rather than cardboard boxes that get musty smelling (along with your porous stuff in them, such as clothing and papers) and water-damaged if there’s a leak where they’re stored, a better option is clear, plastic, stackable totes (or bins) with tight lids. As I’m sure you know, they come in all shapes and sizes so you can use them anywhere around the house. Even though you can see what’s in them, I suggest adding labels with the contents. 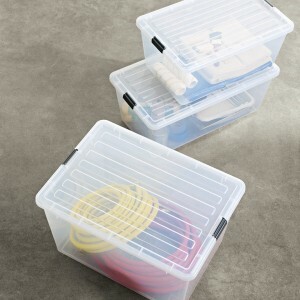 This 17 gallon tote from The Container Store measures 26-3/4″ x 17-5/8″ x 11-5/8″ and sells for $17.99 each. For more information, go to containerstore.com.